DIGITUS CAT 6 F-UTP installation cable, raw, Length 100m, Paper Box, LSOH, AWG 23, Simplex, Color purple. 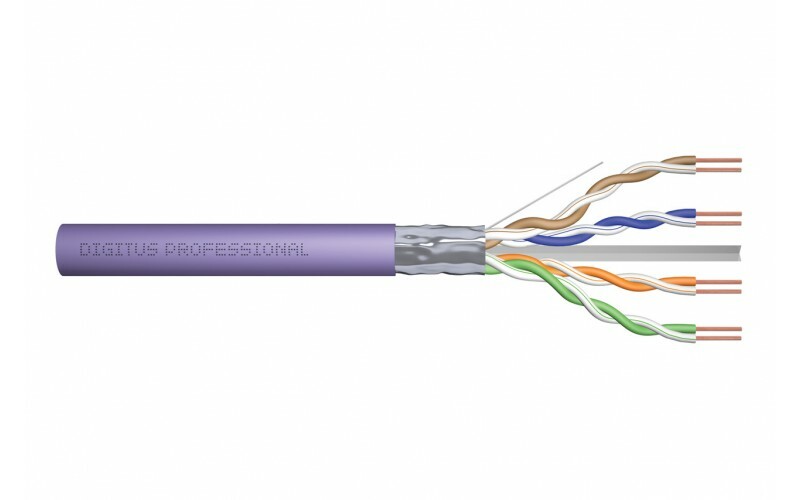 DIGITUS Category 6 F-UTP installation cables are manufactured and tested to the ISO/IEC 11801, TIA/EIA 568B and EN 50173 Category 6 specifications. Every cord consists of 8 color coded AWG 23 polyethylene insulated con-ductors. The conductors are twisted together to form 4 pairs with varying lay lengths. Printing details along the outer sheath includes the brand name and item code. The cable is packed in a paper pullout box or on a wooden drum which makes the installation easy.